If you love Nutella you’re going to go crazy for these chocolate hazelnut brownies! 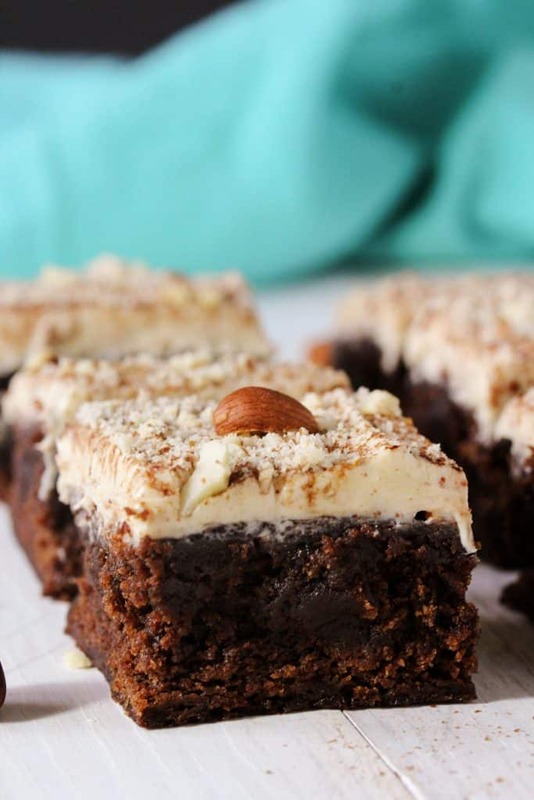 Dense and chewy brownies topped with a creamy, low sugar, high protein hazelnut frosting. Good luck eating only one! 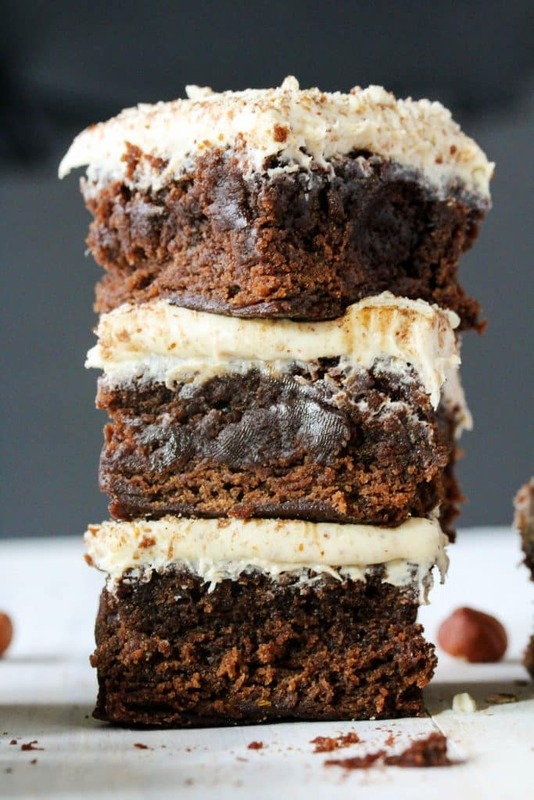 I have a soft spot for chewy, fudgy brownies and these right here hit that spot. 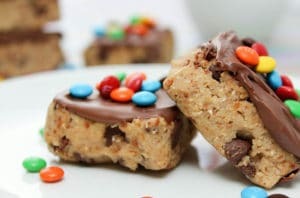 They’re definitely dense and delicious, but have the TINIEST bit of cake-iness, which comes from using a whole can of chickpeas as the main ingredient. Aquafaba (the liquid in the can of chickpeas) and all! Chickpeas are basically a healthy dessert lovers’ dream ingredient. They’re full of fiber and protein. They’re loaded with folate and iron. And, they make baked goods extra chewy. Chewiness all the way! Sorry, if you love crunchy stuff. It’s definitely lacking here on the blog, but I’ll get to it, I promise! 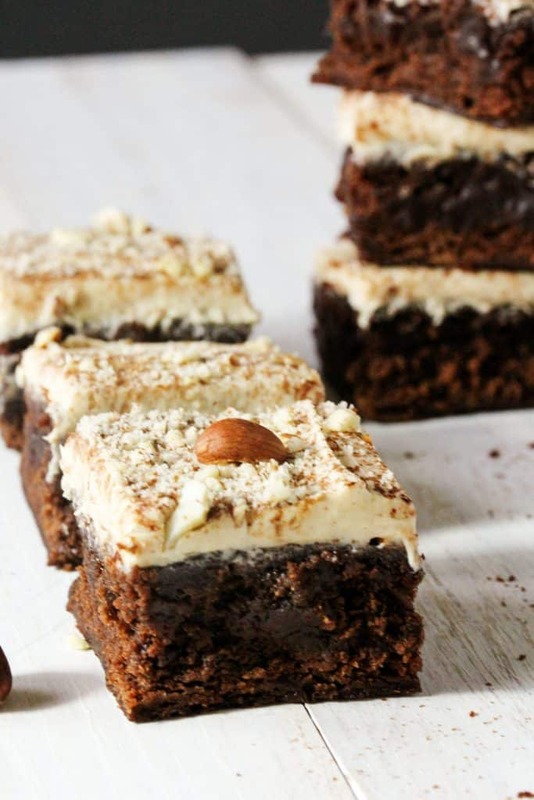 But, if I didn’t have you hooked with all the nutritional benefits, these scrumptious brownies are super quick and easy to whip up. All you really need is a food processor or blender to puree the chickpeas and get them to that lusciously smooth consistency. After that, throw everything together in a bowl and mix it all together and you’re basically done. It really doesn’t get much easier than that. And, then you’re left with vegan, gluten free, dairy free, soy free (basically everything free….besides taste free 😉 ) chocolate brownies. Usually, frostings consist of basically butter and sugar. Far from anything healthy and nutritious. 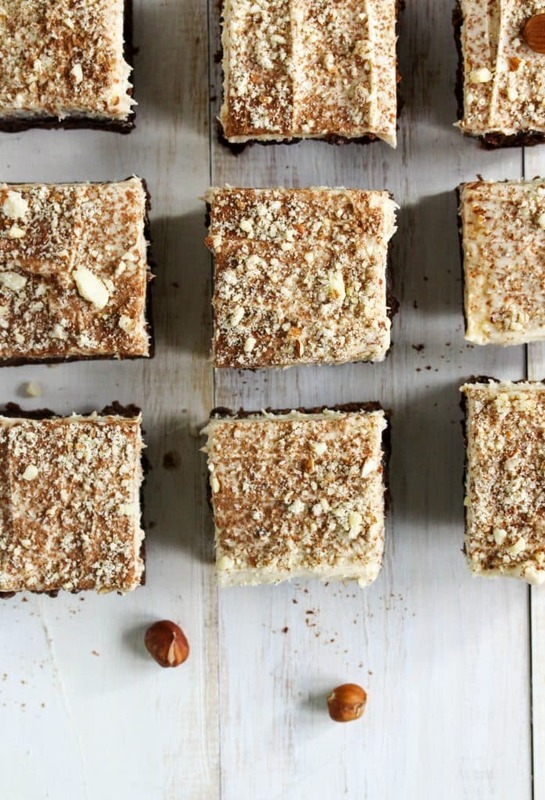 But, this hazelnut frosting has zero butter and only a minuscule amount of refined sugar. And, it’s also loaded with healthy fats and nutritious protein. The creaminess comes from blending the hazelnuts until they’re nut butter consistency, and then whisking in some yogurt. You can definitely do that by hand, but it makes life a lot easier if you use an electric mixer. Whipping the air into the frosting mixture gives it the same fluffiness traditional icing has. Then, pop the frosting in the fridge while the brownies cool. This helps it thicken up and makes it easy to spread over your luscious chocolate brownies. 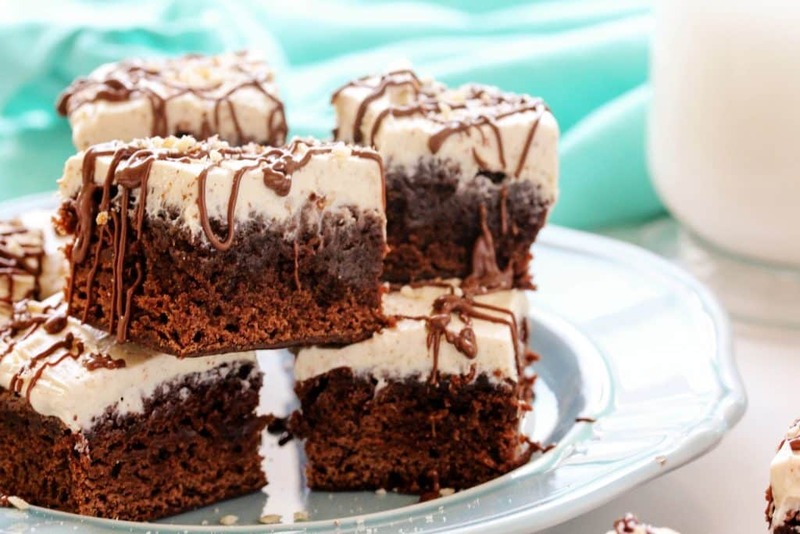 By themselves, the brownies and frosting are finger licking good, but together they’re like nothing else! I dare you to make a batch and not be licking the bowls. Preheat the oven to 325 F and grease or line with parchment paper an 8 X 8 square pan . 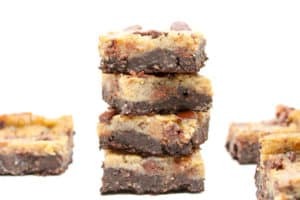 For the brownies: in a food processor or blender , add the oats (not necessary if using oat flour) and the whole can of chickpeas (liquid included). Blend until completely smooth. Add to it the milk, oil, apple cider vinegar, and vanilla extract. Blend just until incorporated. In a large bowl, add the cocoa powder, cornstarch, sweetener, baking powder and soda, and salt (and oat flour if not using whole oats). Whisk to combine. Add the chickpea mixture to the dry ingredients and stir together until incorporated. Pour the mixture into the prepared pan. Bake for 28-29 min. or until a toothpick inserted into the center has a little wet dough on it, but no crumbs. For the icing: while the brownies are baking, add the hazelnuts, agave, oil, sweetener, and salt to a food processor or blender . Blend until completely smooth, scraping the sides as needed. Transfer the smooth mixture to a large bowl, and add the yogurt. Whisk with an electric mixer or wire whisk until fully incorporated and a little fluffier (about 1 min with an electric mixer). Place the frosting in the fridge to thicken up for at least 1 hour. Allow the brownies to cool completely before frosting. Then, spread the thickened frosting on top of the brownies. 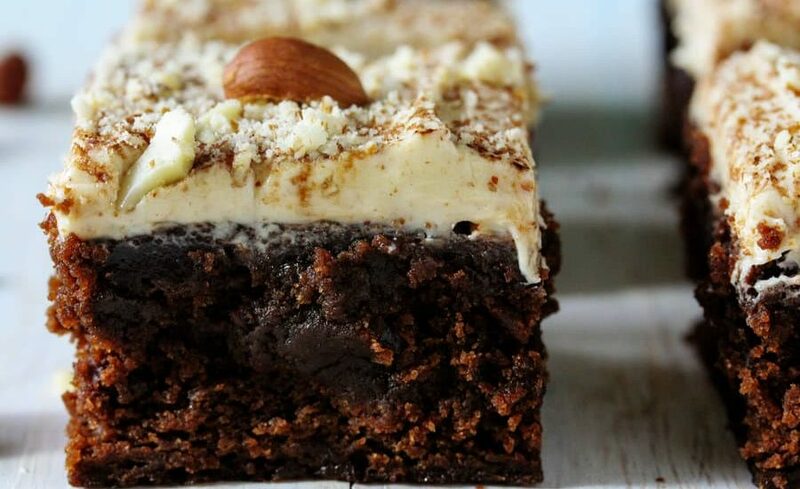 You can also garnish with more chopped hazelnuts or chocolate bits, slice up, and enjoy! I'd like to make these vegan. Has anyone tried this recipe with vegan yogurt? Mine came out almost fudge like. Is that how they're supposed to turn out? They are pretty fudgy. Oven temps and different pan material can affect the baking time though. I'd recommend going with the toothpick test to check for doneness if you think the might be underbaked.